House Minority Leader Nancy Pelosi on Friday attacked Republicans as “despicable” in a misleading fundraising email for the Democratic Congressional Campaign Committee (DCCC), House Democrats’ campaign arm. 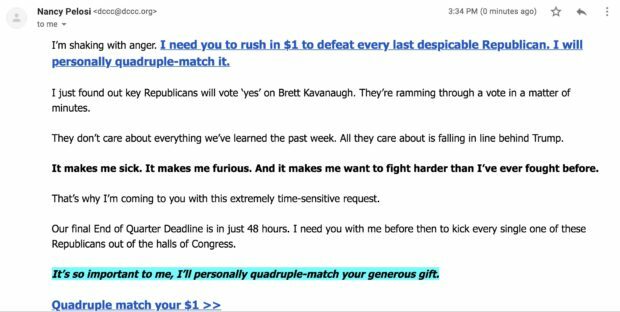 Pelosi claimed to be “shaking with anger” and asked for donations “to defeat every last despicable Republican” in the email, which the DCCC sent out under her name Friday afternoon. As in previous DCCC fundraising emails, including ones under Pelosi’s name, Friday’s email was misleading. Pelosi’s email came after the Senate Judiciary Committee voted to advance Kavanaugh’s confirmation to the Senate floor, and after Republican Arizona Sen. Jeff Flake — a key swing vote — said he wouldn’t support Kavanaugh in the final vote unless the FBI first investigated a sexual assault claim against Kavanaugh. Even before Flake’s delay, the floor vote wasn’t scheduled to take place until Saturday. In no way was Kavanaugh “a matter of minutes” away from being confirmed to the Supreme Court when the DCCC sent the email. The DCCC on Sept. 21 sent out a similarly misleading that falsely claimed Senate Majority Leader Mitch McConnell resumed the Kavanaugh hearings without looking into the assault allegation and that Kavanaugh was “hours” away from confirmation. The DCCC in July sent out an email under Pelosi’s name falsely claiming to need 100,000 signatures in order to “block” Russian President Vladimir Putin from visiting the United States at President Donald Trump’s invitation. Democratic supporters who signed the “petition” were immediately redirected to a donation page.